It's funny.. 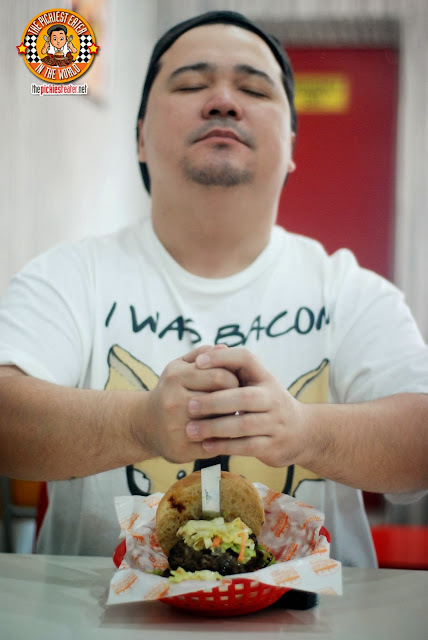 Whenever I'm out with my officemates during out fastfood lunch break run, and they all order rice meals, and I order a burger, their reaction is usually, "Amerikano kasi yan, eh!" ("Cuz he's an American!"). Although I am proudly Filipino, I admittedly often do favor more Western dishes to pinoy classics. But in this case, I don't agree. My love for burgers has nothing to do with my heritage. I think it's just because the awesomeness of burgers is universal, regardless of where you're from, you can't NOT love a good burger. So what happens when you take me to a Burger place that sells GREAT ones? 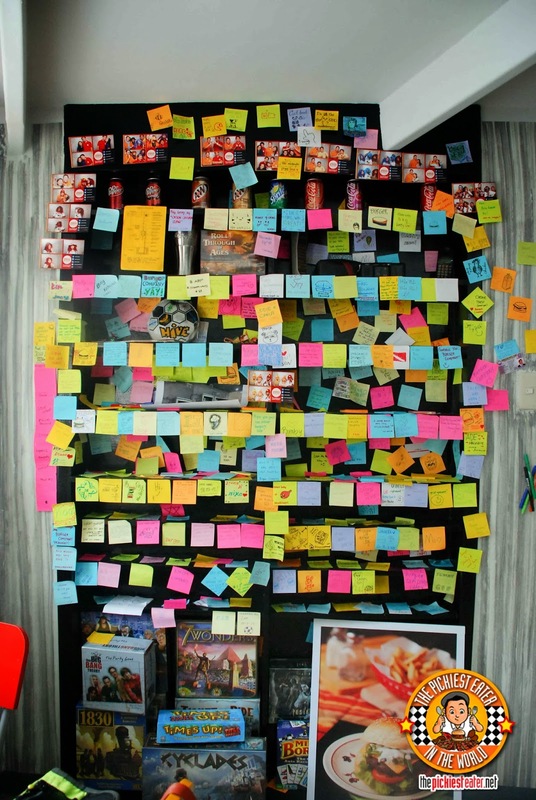 Some place like, Burger Company, perhaps? 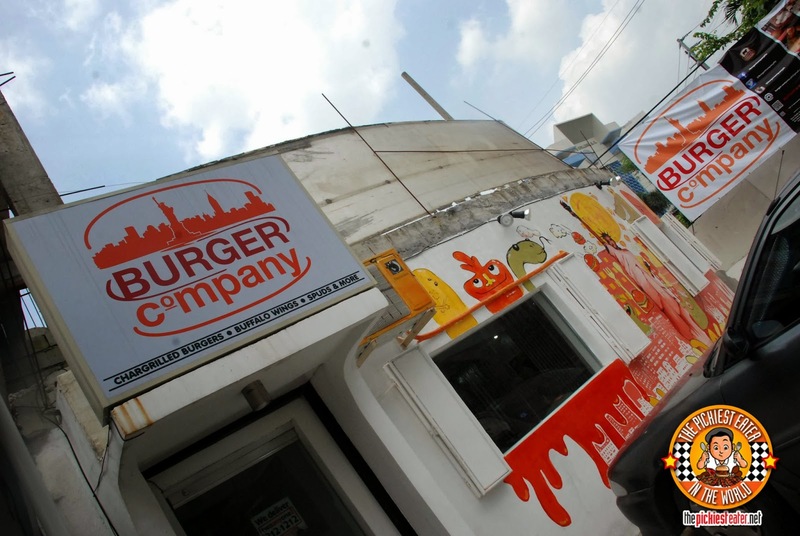 I unfortunately was never able to visit the predecessor of Burger Company, which was the quaint little Boulevard Diner. But based on the comments I got from the picture I posted of Burger Company's Gorgonzola Burger on my Pickiest Eater Facebook Page, it broke a lot of hearts when it closed its doors. 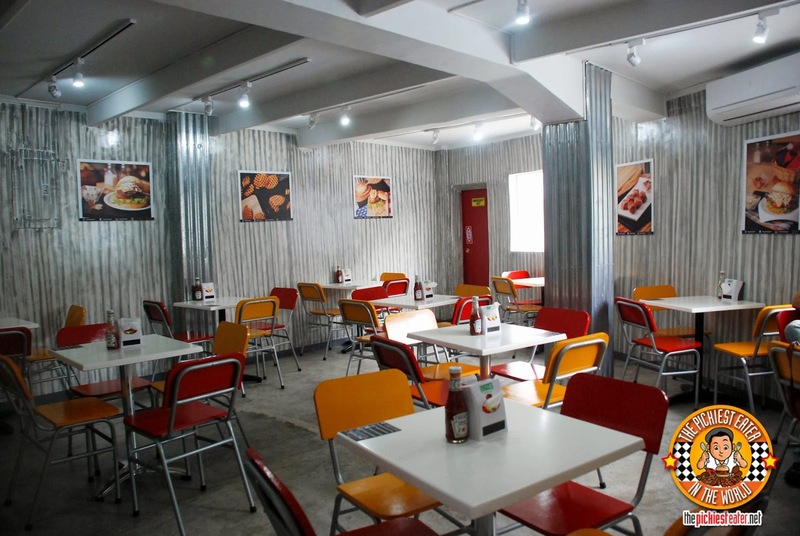 Luckily to Boulevard Diner's loyal fans, soon afterwards, they moved to a bigger, better location, equipped to handle more parking and more customers, and still within Quezon City. Even from the facade, the mural gives you the vibe that this is a restaurant that knows how to have fun. Inside, you are give a sleek, industrial feel, with vibrant colored chairs adding to the playful atmosphere. For those who love board games (me), you have a whole bunch to choose from while waiting for your food to arrive. Burgers and fries. It should be illegal to have one without the other.For me, that's sorta like bacon without garlic rice. They're good individually, but when you bring them together, magic happens. 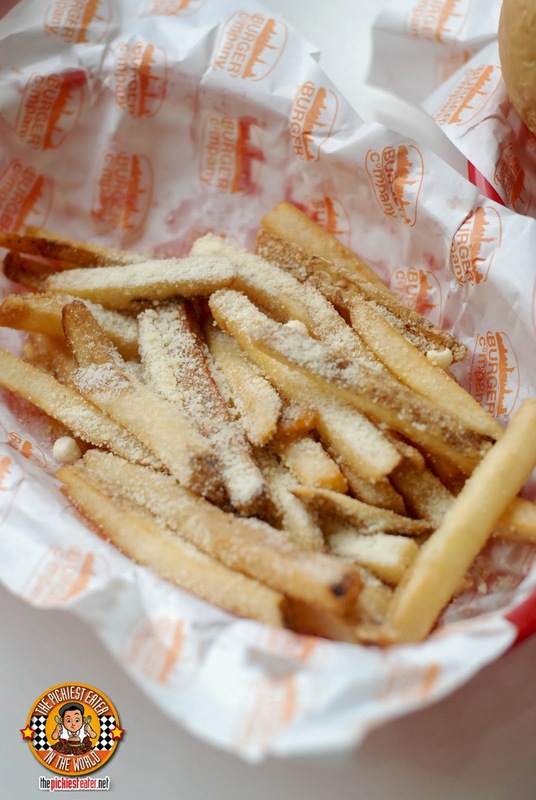 Burger Company has a selection of fries on their menu, and the Parmesan Fries is the one that caught my attention. Beautiful golden fried french fries, topped off with a sprinkling of Parmesan that works perfectly with any burger you may choose from the menu. 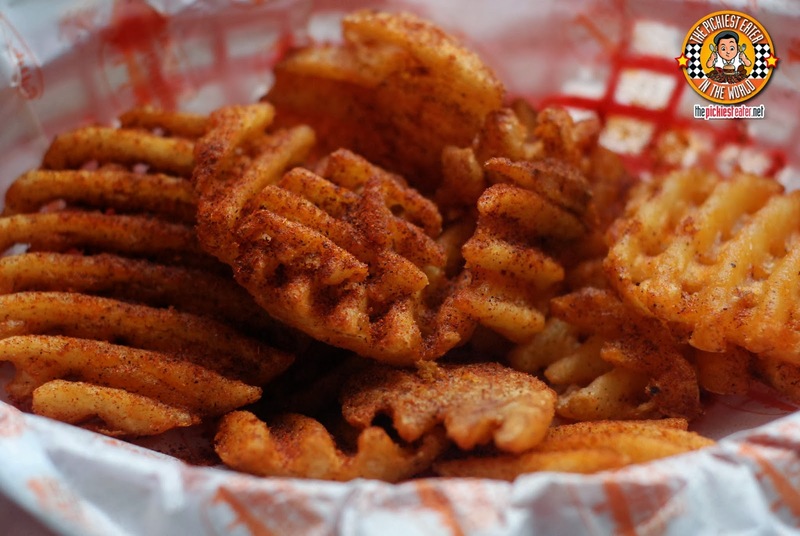 You could also choose to go the Crisscut Route, and try Burger Company's Crisscut Fries (Solo P60/Sharing P95/Party P140). 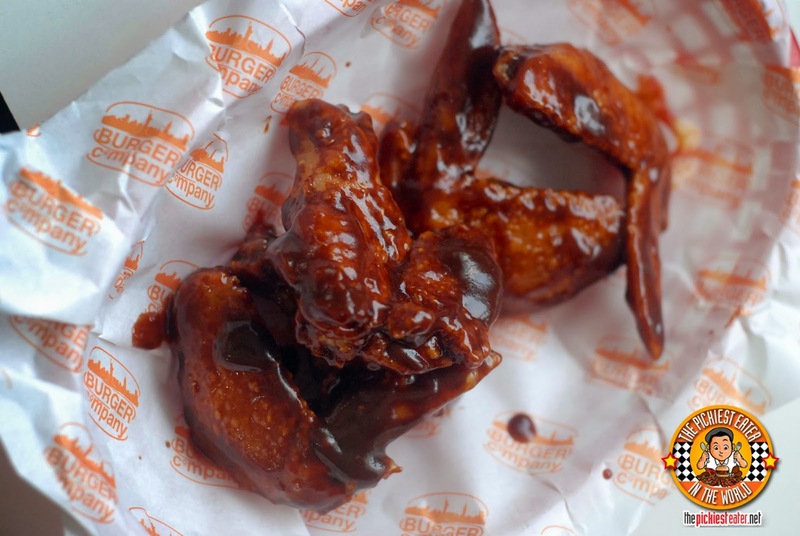 Which they also have in a spicier flavor called the Buffalo Trax (Solo P65/Sharing P110/Party P165). Tell me.. Has this ever happened to you before? You declare that you're full. 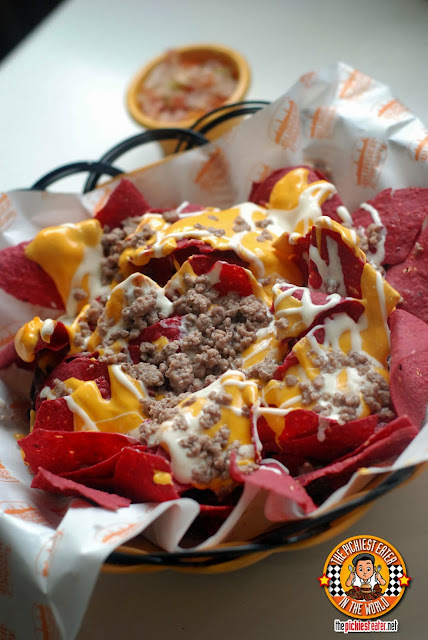 Two minutes later, a platter of gloriously crispy nachos with gooey melted cheese, tasty ground beef, with sour cream and salsa drizzled on top is placed right in front of you. Suddenly, your stomach miraculously seemed to have found some extra wiggle room, and you suddenly finding yourself grabbing one handful after another. 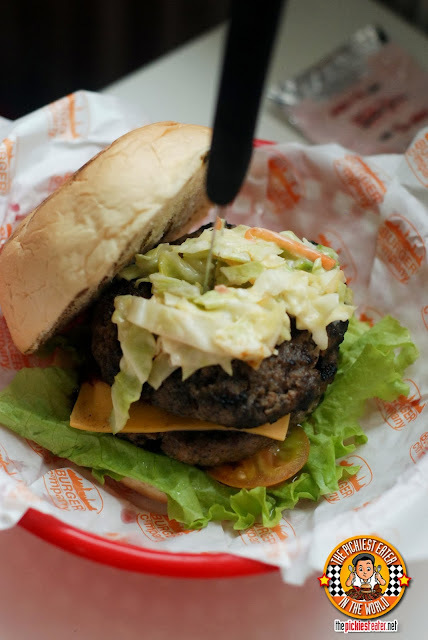 Expect that to happen with Burger Company's Nacho Overload (P195/P290). Rina: Babe, do you want to try the Jalapeno Fritters? Richie (Shoving his 4'10 wife out of the way): WHERE?!??! Yes, I don't usually eat Jalapenos. 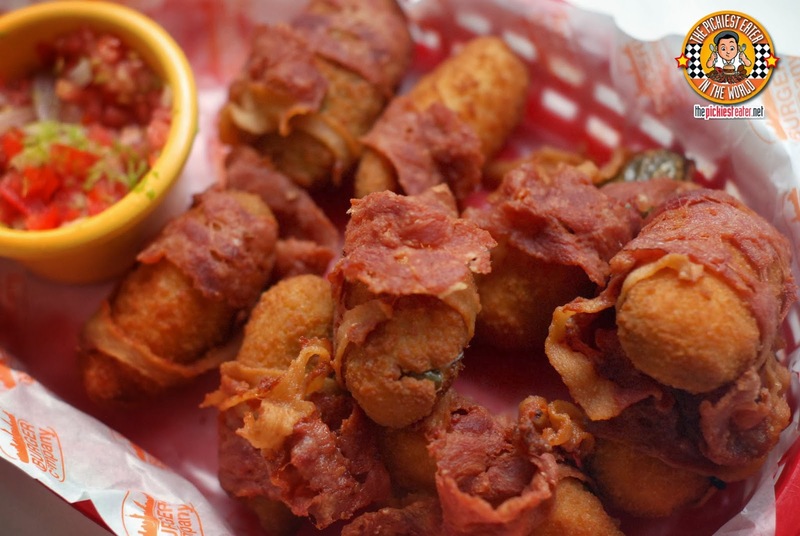 But I am powerless to the lure of a bacon wrapped anything, including the Bacon Jalapeno Fritters, that had an explosion of cheesiness, mixed with a touch of heat, in every bite (You wrap your slippers in bacon, there's a good chance I might try to eat it). If you like heavier appetizers, then you should give Burger COmpany's wings a try. Asian Samurai Wings had a delectable sweetness to it that was incredibly, finger licking good. But the star of the show is undoubtedly the Burgers. Burger Company uses Certified Angus Beef Patties, with some herbs and mixed in for some extra awesome. 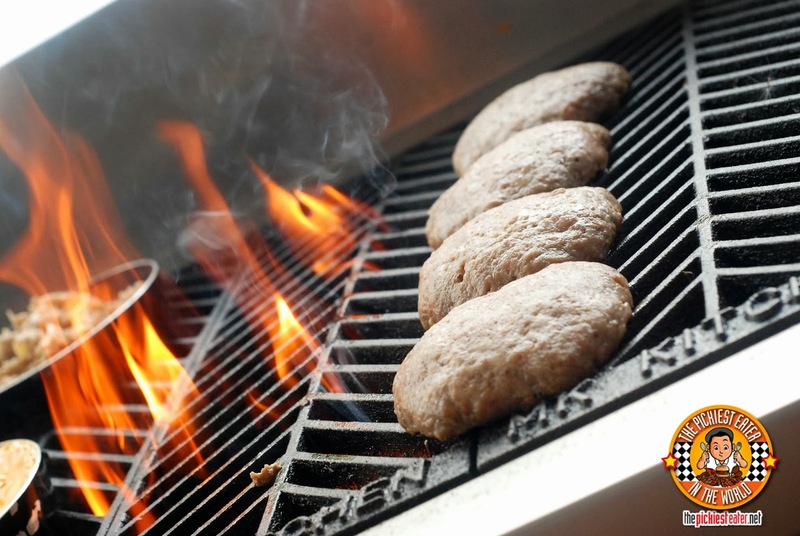 The cast iron grill is right by the entrance, so you get a whiff of the meaty aroma of the burgers as the patties are being licked by the flames. 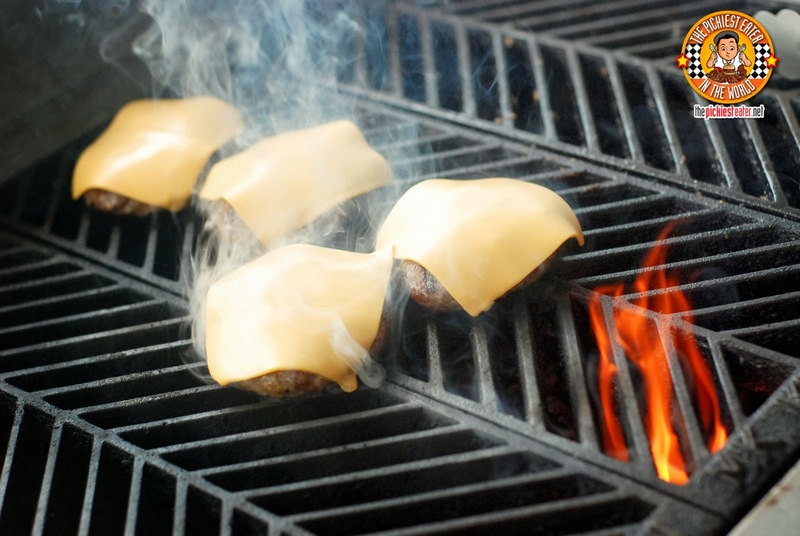 When you ask for a cheeseburger, the slice is placed on the patty whilst it's being grilled, allowing the cheese to blanket your meat, with its flavor slowly seeping into it. I mean it. 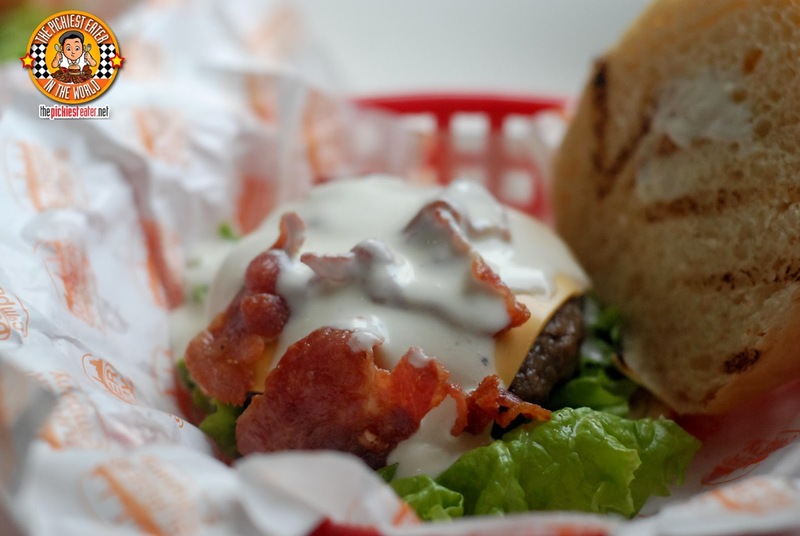 The picture I posted of Burger Company's Gorgonzola and Bacon Burger (Single P209/ Double P325) nearly broke my Instagram account. People with fond memories of enjoying this Bacon cheeseburger topped with the signature Gorgonzola dressing at Boulevard Diner was brought to tears, as if they were reunited with a long lost friend. The amazing thing about Burger Company's Gorgonzola is how the pungent taste of Bleu cheese isn't so prominent. The sharpness is much milder, and it serves more as an enhancer to the burger patty's natural flavor. This also went well with their Gorgonzola and Mushroom Burger (Single P199/Double P315). a try. 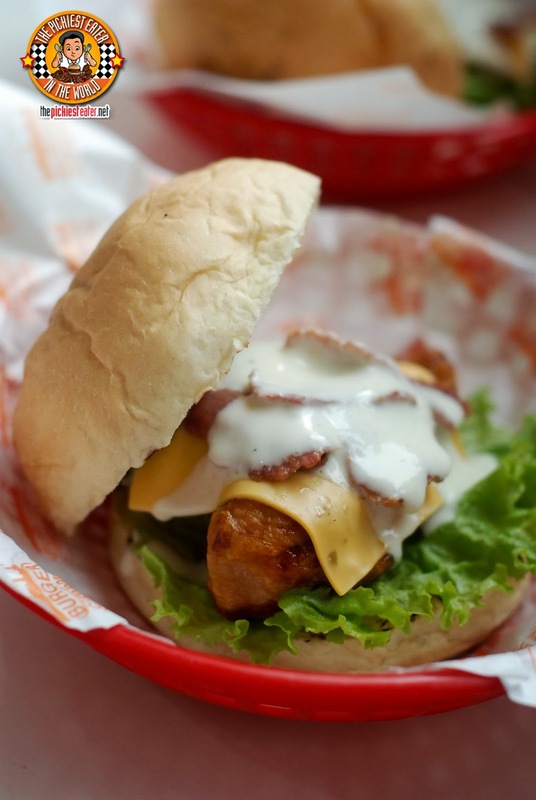 Instead of the Angus Beef Patty, a lightly breaded Chicken fillet is used. Rina thought I was going to order the B.O.B. 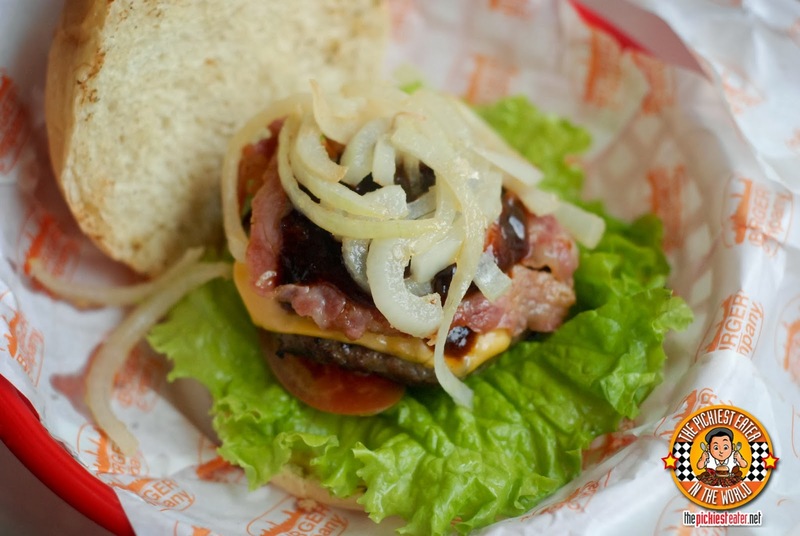 Burger (Single P195/Double P309), which is a Bacon Cheeseburger slathered in Burger Company's BBQ Sauce, and topped off with onion shreds. Definitely my kind of burger. Rina absolutely demolished her Bacon & Egg Burger (Single P205/Double P319), and nearly snapped my hand off when I tried grabbing a bite of it. 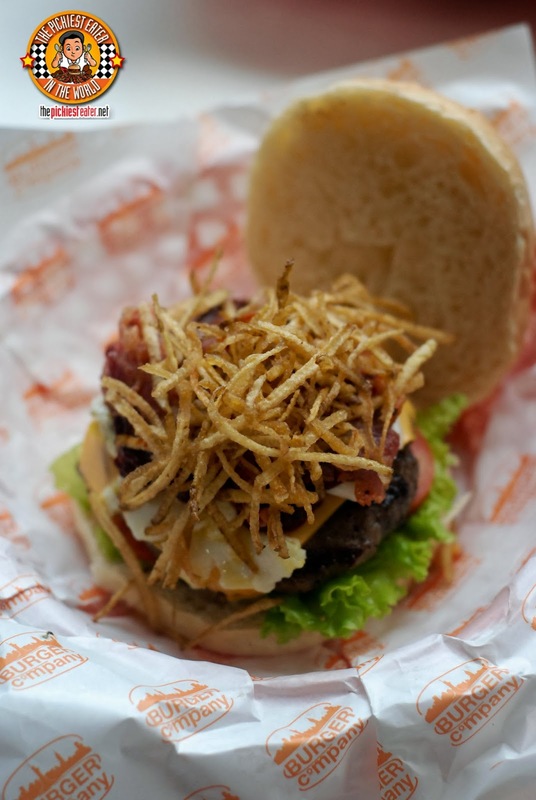 The Burger has bacon, a perfectly fried egg, and topped off with crispy potato strings. Braised Chipotle is also added for a bit of heat. The Big Daddy of Burger Company's roster of burgers is The Strikers Burger (Single P239/ Double P355). The Striker gives you a double heaping of Bacon, a double dose of Cheese in the form of a slice and sauce, Crisscut Fries and Champignon Mushrooms. Not to be lost in the sea of burgers, is Burger Company's Rib Eye Steak (P350). This 8 Oz. USDA Choice Ribeye Steak had a tenderness to it that belied its very affordable price. Served with garlic mashed potatoes that could have used a tad bit more salt, and buttered vegetables. 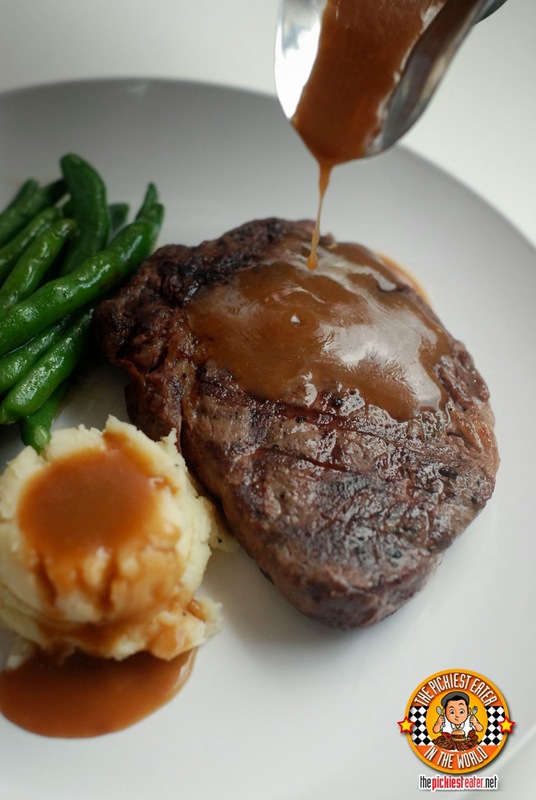 The gravy served with the steak is actually the french brown sauce known as "Demiglace", and serves as the perfect companion for your steak. Top cap off your fine meal, you should try a slice of Burger Company's Chocnut Chocolate Mousse. 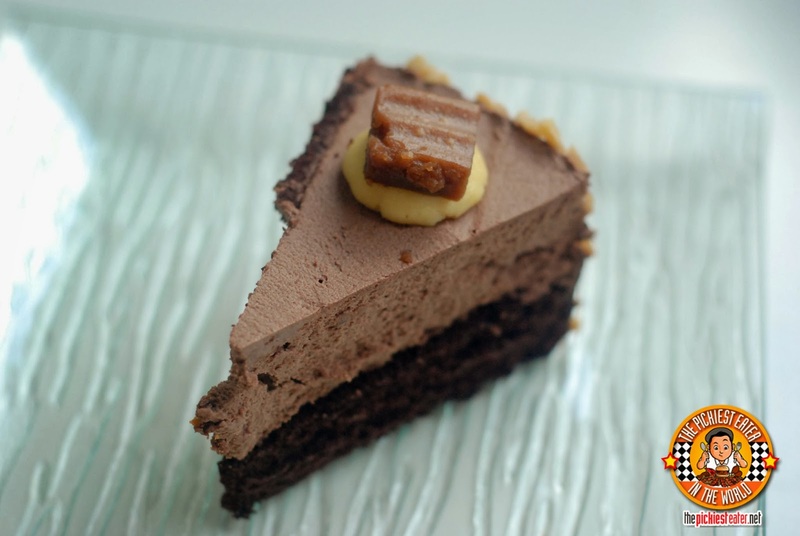 A moist chocolate cake and Chocolate Mousse mixed with Choconut is pretty hard to say no to, don't you think? When all is said and done, you're encouraged to leave a little post it note so that other guests will know you were here. One of my biggest regrets, was never being able to try Boulevard Diner's juicy burgers, but thanks to Burger Company, I get to check that off my bucket list! The prices are extremely reasonable, and the quality of the burgers is unquestioned. 72b Scout Reyes, Cor. 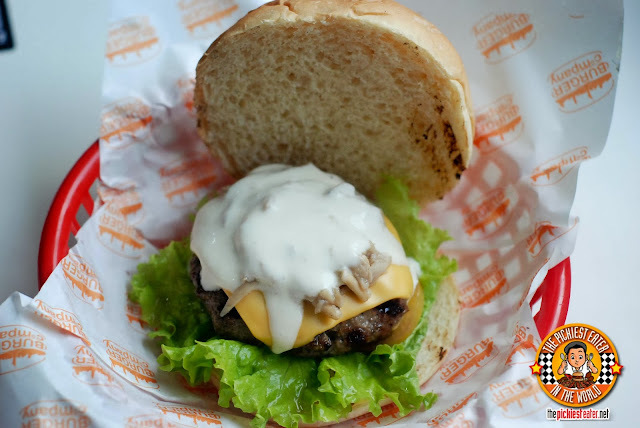 Mother Ignacia St.
Good thing Burger Company is just a jeepney ride away from me. 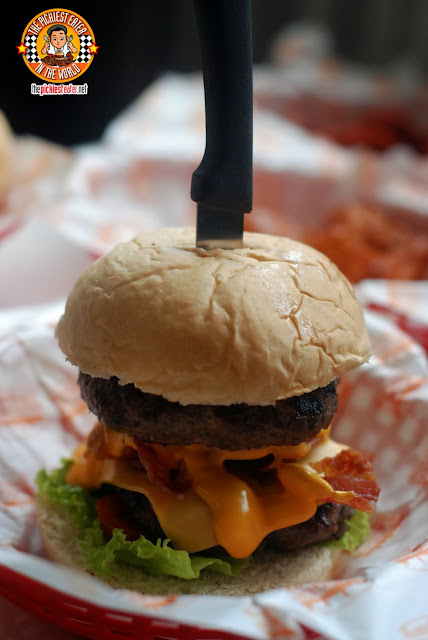 I must try this one most especially the fries, bacon jalapeno fritters and of course the burger. I Freakin' love Burgers!! Will definitely try this place!! Ü BTW, that Strikers Burger looks legendary!! It's pretty awesome! Hope you enjoy as much as I did! I was heartbroken when I saw Boulevard Diner closed. But glad they opened up to a bigger location. haha you're gonna have it again soon bro!! only you can say what you like better... So I suggest you give it a try! Lemme know which one you like, Aki.. I'd love to hear what you think of both! 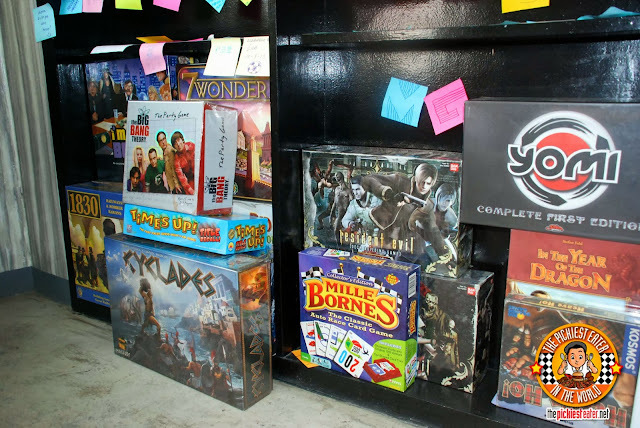 BLOGOPOLIS 2013 : INTO THE WILD! A HUGE OISHI! 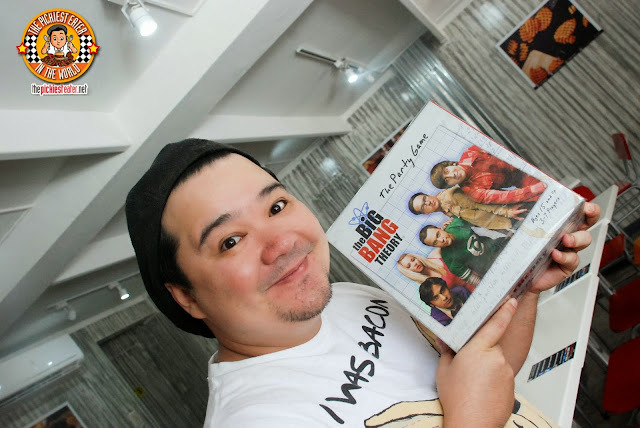 THE OISHI JEEP-O BLOG GIVEAWAY!